Photo Galleries Presentation to Cowes Sailability 2015 INTERNATIONAL YOUTH SPEAKS 2016 INTERACTORS SUPPORT IW FOODBANK COWES WEEK 2016 COWES ALZHEIMER CAFE IS GIVEN Â£500 ACTIVITIES SUPPORTED 2015/16 What Is Rotary? Visit from La Rochelle Rotary Club May 2016 CHRISTMAS CONCERT 2015 COMMUNITY HANDOVER 2015 FUND RAISING LIKE TO JOIN US? 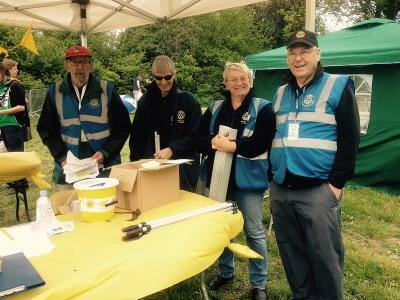 Rotary Club of Cowes organised the Carisbrooke Check Point for the annual Walk The Wight event which covers 27 miles from Bembridge to the Needles. On the day participants were registered, time cards marked and vehicles/buses marshalled at the Drop Off/Pick Up point. The event raises over £250,000 for the Earl Mountbatten Hospice. The Rotary Team, consisting of Jamie, who arranged the whole day for the Club, Max, Mike, Patrick, Lesley, Barry, Jane, Tony, Keith, John, Simon, Bob and David, was in place by 7 a.m. and all were kept busy until 2.30 p.m. when the site was dismantled and the last weary walker having moved on or departed back to Newport by bus. The Rotary Team even had its own Tea Truck for the day supplied by Barry & Lesley.